Lady Apostle Lands in Jail! – Open Our Eyes, Lord! If I asked you “Who were the martyrs of the early church?” you would, quite properly, begin with Stephen in Acts 7; James in Acts 12; and then go on to Peter and Paul. But not a complete answer. Christian women were singled out for persecution in a way that their Jewish and Gentile contemporaries were not. Let us first honor those Jewish women who were victims of persecution. In the Maccabean period, these martyrs fall into two categories: (1) many thousands were casualties of war, killed, or taken into slavery: thus, when Antiochus attacked Jerusalem, he is said to have killed 80 thousand Jews, including women and children. (2) At the same time, the Greeks executed some individual Jewish women, typically because they had ignored the prohibition and circumcised their male babies. If women of Second Temple Judaism were only rarely targets of individual persecution, usually because they were faithful covenant mothers, then by contrast, Christian women of the early church were targeted right alongside their male compatriots. We begin with Jesus’s crucifixion. 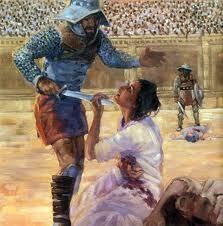 The Romans sometimes jailed or executed women, but that only rarely took place. This may provide some background for the fact that the male apostles fled, while many female disciples stood firm: “Near the cross of Jesus stood his mother, his mother’s sister, Mary the wife of Clopas, and Mary Magdalene” (John 19:25); in another version there were “Mary Magdalene, Mary the mother of James the younger and of Joseph, and Salome…[with] many other women” (Mark 15:40-41). While that is a reproach to the men and a credit to the women’s courage, it is also the case that the Romans would not bother arresting female disciples. The earthly powers stopped giving women a pass some time after the day of Pentecost, when was fulfilled Joel’s prophecy, that “on my servants, both men and women, I will pour out my Spirit in those days” (Acts 2:18). History records that women of the New Covenant began to be persecuted in ways that their counterparts in the Old Covenant had not. This is because, the sisters in Christ are not equals just in the abstract (the terms “positional” or “spiritual equality” are common ways to erode their status); if their path to discipleship includes the risk of death, then they are the equals of their Christians brothers. The persecution under Saul signaled this new paradigm. He was so ferocious in his zeal against the disciples, that “Saul began to destroy the church. Going from house to house, he dragged off both men and women and put them in prison.” (Acts 8:3; the Greek τε ἄνδρας και γυναῖκας is emphatic: “Not only the men, but even the women!”). The same sort of language comes up in another account of that persecution, in Paul’s own words: “I persecuted the followers of this Way to their death, arresting both men and women and throwing them into prison” (Acts 22:4). Saul’s wrath was such that he dragged women from their own homes, an extreme behavior that most Jews and Romans would be appalled at: he was acting out of blind frenzy. In yet a third account, Paul states that he sought the death penalty whenever it was possible: “and when they were put to death, I cast my vote against them” (Acts 26:10). He does not say whether he executed female disciples, nor does he exclude the possibility. The fact that women were put into jail in the first place probably indicates that they would face the same dangers that the men did. Thus, from the earliest days, the church’s enemies arrested, jailed, interrogated, tortured, and executed Christian women. Most of the brave men and women who died for Christ are unnamed. This verse has been batted back and forth for many years. Part of the issue was that the name Junia was often taken as a man’s name, Junias. Andronicus is certainly a man’s name, and so both of these would have been male colleagues of Paul who had suffered imprisonment. Lately however, more literary evidence has come to light, which shows that Junia was almost certainly a woman, since Junias was not a known male name. Thus, it is highly likely that Andronicus and Junia, like Priscilla and Aquila in 16:3, were a married couple who traveled together and in their work for Christ. The second issue of interpretation is, what it means that they are “outstanding among the apostles.” One view is that, “the apostles themselves think these two are outstanding.” The other is that “they are apostles, and outstanding ones at that!” The language suggests the latter – they are not equal to the twelve apostles, but like others in the New Testament, they are “envoys” or pioneer church-planters (see for example Barnabas in Acts 14:14); in other words, they are small-a-apostles, not two of the Apostles. In that case, Paul is saying that: the couple Andronicus and Junias are Jewish; they were Christians before Paul was, that is, within the first year or two of the church’s existence in Judea; they were outstanding as apostolic church-planters; they both were put in prison with Paul at some unspecified occasion. …written mainly to grab your attention, since I would no more want to call the apostle Junia a “lady apostle” than to call someone a lady surgeon or a girl airline pilot. Junia was an apostle, as was her husband, as was Barnabas. They literally “risked their necks,” that is, they may have faced the threat of execution by beheading, although Paul may be speaking of a death sentence in broader terms. At any rate, Priscilla risked her life, along with the two men, at some unmentioned occasion. And given the work they did, perhaps they would fit in the same category of apostolic church-planters. Matters in Rome went from bad to worse. During the persecution under Nero in AD 64, both men and women were arrested and underwent torture and execution: “In their very deaths they were made the subjects of sport: for they were covered with the hides of wild beasts, and worried to death by dogs, or nailed to crosses, or set fire to, and when the day waned, burned to serve for the evening light.” We know from 1 Cor 9:5 that Peter’s wife traveled with him. A later legend has it that she too was executed: “They say, accordingly, that the blessed Peter, on seeing his wife led to death, rejoiced on account of her call and conveyance home, and called very encouragingly and comfortingly, addressing her by name, ‘Remember thou the Lord.’” We cannot say whether the story of Peter’s wife (and Thecla, below) is true or not; we can infer, however, that Christians in the 2nd-century church did not find it strange that their female leaders might be martyred. The Pakistani Christian Asia Bibi is a current example of a faithful Christian witness: this wife and mother has been in prison since 2009, because of her testimony to other women and her affirmation to them that her Christ is alive, not dead. She was beaten, locked away, arrested, and then sentenced to death. Her case is still pending in 2018. Meanwhile, the self-proclaimed male and female “apostles” of today are as likely to be living in luxury as going to the stake. A wife ought not to make friends of her own, but to enjoy her husband’s friends in common with him. The gods are the first and most important friends. Wherefore it is becoming for a wife to worship and to know only the gods that her husband believes in, and to shut the front door tight upon all queer rituals and outlandish superstitions. For with no god do stealthy and secret rites performed by a woman find any favour. By marrying her husband, a woman embraced his religion. Christianity was regarded as one of the principal secret sects; it was suspicious, and it made women seem like rebels against family, culture, state, and heaven. For example, the legend of Thecla has it that she was a disciple of Paul, who rebelled against her culture by breaking with her fiancé. She preached the gospel alongside of Paul, and was sentenced to death more than once, but survived and lived to an old age. Thecla’s initial “crime” was to not marry. But let us be clear: someone who suffers or dies because Christ makes her stand out from society is a martyr, period. and most notably, Perpetua, the mother of an infant, and her slave Felicity, who gave birth in prison at the last minute, died by a gladiator’s sword. We can reason that, the devil – having sought God’s permission to target those who infuriate him most – persecutes, tests, imprisons, and kills both women and men who faithfully serve Christ. Working backward, using the logic of “effects-to-cause reasoning,” we can deduce that the effects (a surprising number of Christian women are persecuted along with Christian men) has a comprehensible cause (Christian women and men are both doing damage to Satan’s kingdom, and both need to be stopped). Women were persecuted because they were a danger: planting churches in virgin territory; leading 400 people to Christ; women – slaves at that! – serving as deacons. For the Romans, they were perpetrators of a perilous and divisive cult; for the devil, they were despised and powerful agents of God who were prying souls away from his global kingdom. 2 Maccabees 5:11-14 NRSV – “When news of what had happened reached the king, he took it to mean that Judea was in revolt. So, raging inwardly, he left Egypt and took the city by storm. He commanded his soldiers to cut down relentlessly everyone they met and to kill those who went into their houses. Then there was massacre of young and old, destruction of boys, women, and children, and slaughter of young girls and infants. Within the total of three days eighty thousand were destroyed, forty thousand in hand-to-hand fighting, and as many were sold into slavery as were killed.” See also 3 Maccabees 4:6-7 Charlesworth – “The young women who had but recently entered the bridal chamber for the society of married life exchanged their joy for wailing, and, with their perfume-drenched locks covered in dust, they were carried away unveiled and all joined in singing a dirge instead of a wedding hymn, as if torn asunder by the brutal mangling of the heathen. And in full view of everybody they were forcibly dragged along in bonds until they were embarked on board ship.” In another war, Herodotus records as an atrocity of particular interest that women were impaled around the city wall just as the men were (Persian Wars 4.202, LCL 118:405). 1 Maccabees 1:60-61 NRSV – “According to the decree, they put to death the women who had their children circumcised, and their families and those who circumcised them; and they hung the infants from their mothers’ necks.” Also in 2 Maccabess 6:10 NRSV – “For example, two women were brought in for having circumcised their children. They publicly paraded them around the city, with their babies hanging at their breasts, and then hurled them down headlong from the wall.” 4 Maccabees 4:24-25 Charlesworth – “And when by his decrees he failed completely to destroy our people’s respect for the Law, and observed that all his threats and penalties were entirely discounted, even to the extent that women who knew in advance what was in store for them were hurled headlong from the walls with their infants because they had their children circumcised.” Most famous of all, the mother of the seven sons who were killed is held up as an example of courage and piety. She watched while one by one her sons were tortured and killed; her fate is unclear – in the end she died, perhaps by execution. Jews and Christians held her in high honor. A freedwoman was crucified under Tiberius for gross misconduct (Josephus, Antiquities 18.3.4 §79), but the verdict was so unusual it came up for special mention. Craig Keener states that Acts 8:2-3 “probably emphasizes not only Saul’s savage hostility to the disciples but also the women disciples’ courage and faithfulness.” See Acts: An Exegetical Commentary (Grand Rapids: Baker, 2013), 2:1483. Clement of Alexandria, Stromata 7.11, ANF 2:541. Clement also states that the male apostles took female co-workers with them, because they would be able to speak to women without raising suspicion: “But the [apostles], in accordance with their ministry, devoted themselves to preaching without any distraction, and took women with them, not as wives, but as sisters, that they might be their co-ministers (sundiakonoi) in dealing with women in their homes. It was through them that the Lord’s teaching penetrated also the women’s quarters without any scandal being aroused.” So Stromata 3.6, which ANF leaves in Latin because of its delicate topic. Plutarch, Moralia Conjugalia Praecepta 19, http://penelope.uchicago.edu/Thayer/E/Roman/Texts/Plutarch/Moralia/Coniugalia_praecepta*.html. See more details at http://www.callformercy.com/. Eusebius, History of the Church 3.18.5, NPNF 2, 1:148. Jewish tradition holds that she was Jewish, hence perhaps she was Jewish Christian. See the full text of Pliny’s letter at http://www.vroma.org/~hwalker/Pliny/Pliny10-096-E.html. 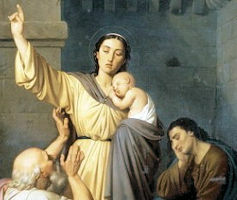 See particularly “Women Martyrs in the Early Church,” http://www.cbeinternational.org/resources/article/priscilla-papers/women-martyrs-early-church. It should be noted that some of these accounts contain legendary elements; but this can be said for the accounts of contemporary male martyrs as well. The eyewitness account of their martyrdom can be read in the gripping “The Passion of the Holy Martyrs Perpetual and Felicitas,” http://www.earlychristianwritings.com/text/tertullian24.html. Thank you Gary! It is good to read about the saints before us. A very good work. Do you have it in spanish?